Although I did play a few sports in my younger years, I never imagined I’d be a sports mom. I grew up riding horses and loving the farm life. My son absolutely loves the farm and helping with chores any chance he can get but he also loves his sports, especially baseball. I never thought I’d be that mom but I’m suddenly consumed by baseball. It is constantly on my mind. I was excited to be asked to work with BODYARMOR to bring you these sports mom survival kit essentials. Keep in mind that all thoughts and opinions are my own. My son plays many different sports but baseball has become his passion. He spends hours upon hours practicing and absolutely loves every minute. Now that I’ve become that mom, I find myself researching the best bat for the next season, driving my son two hours to a pitching coach every week (sometimes twice a week) and finding the best essentials for my sports mom survival kit. Yes, sports moms must have a survival kit. And so, I have put together the perfect list of sports mom essentials. You’ll thank me later! Folding Utility Wagon. As we walked in to our first travel game of the season I knew I had done good. I smiled as I got an imaginary pat on the back from my husband. Yes, it was wagons galore! I didn’t get one snarky remark from my husband about the wagon. Instead, he admitted that it was a good idea after we walked half a mile to the field through the complex, wagon in tow. A folding utility wagon is a must. I gave my cousin a hard time about all the stuff in his SUV for baseball season a few years ago. Now I find myself with those same essentials. I couldn’t live without this wagon. Since I have a bad back, it definitely saves it from more aches and pains by lugging around chairs, bags and other gear on my arms. The wagon will be the holder for all those other important essentials. First Aid Kit. Normally the coach or his wife has a first aid kit on hand but it’s always important to be prepared for the unexpected. Make sure your first aid kit is stocked with instant cold packs, band-aids, ibuprofen and elastic bandages. You never know when your kid will suffer from a cut or broken bone. We’ve been pretty lucky so far but my son did suffer from a broken finger this past baseball season. Blanket. We have four very different seasons here in Missouri. It could be snowing or freezing during the start of the season so I always take a blanket and jacket or sweatshirt. My son always has a sleeve or undershirt to wear just in case. You’ll be glad you have that blanket once the sun sets. Drinks and Snacks. Snacks are a great idea when you have several games in one day. I always pack fresh fruit, veggies and snack bars. Always pack a premium sports drinks and water to stay hydrated. 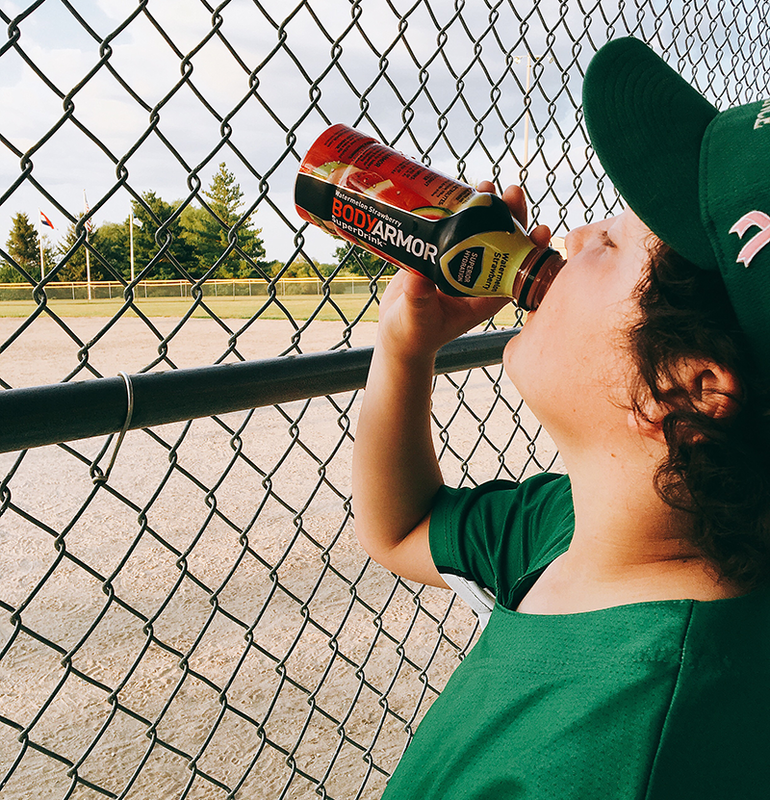 My son loves BODYARMOR so I always make sure to have some on hand for games. It’s a premium sports drink with potassium-packed electrolytes, coconut water and vitamins – and has no artificial flavors or sweeteners. My son loves to rotate between the 9-great tasting flavors: fruit punch, orange mango, strawberry banana, tropical punch, blackout berry, mixed berry, grape, watermelon strawberry and lemonade. Plus, it provides superior hydration. I always stock up on BODYARMOR while shopping at Hy-Vee. I’ll admit, I’m not a fan of traditional sports drinks because of all the artificial flavors. 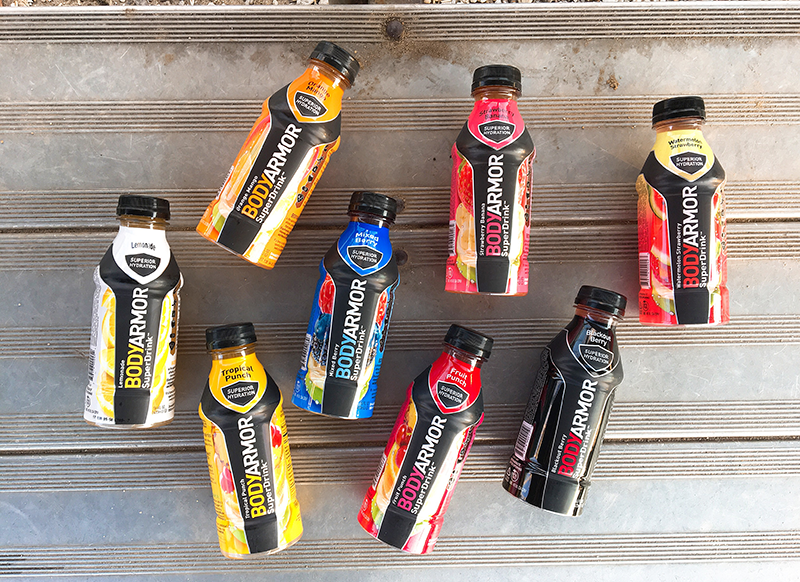 BODYARMOR is a healthier alternative to traditional sports drinks because it contains natural flavors and sweeteners and no colors from artificial sources. 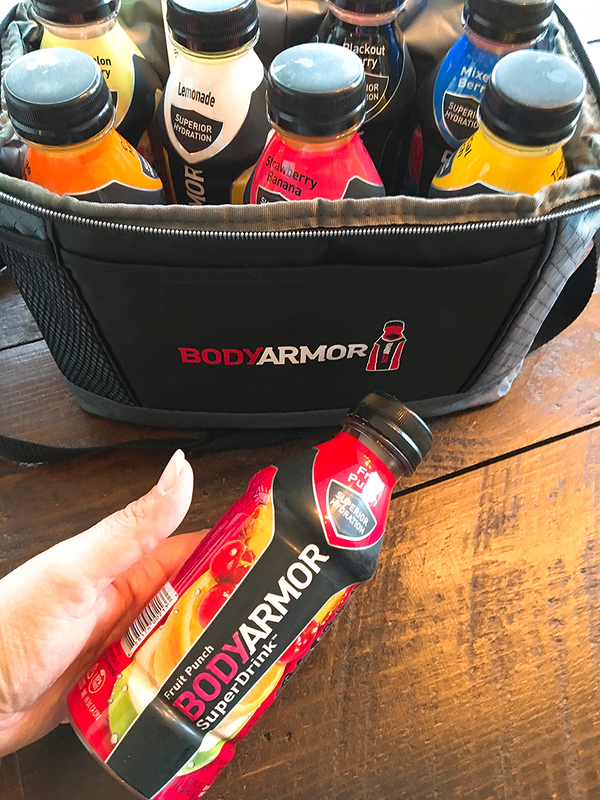 BODYARMOR is the brand of choice for athletes and has assembled an impressive team of young, superstar athletes such as James Harden, Mike Trout, Dustin Johnson, Andrew Luck, Richard Sherman, Dez Bryant, Anthony Rizzo, Buster Posey, Skylar Diggins and several others. Chairs. Be sure you bring your favorite folding chair especially if you aren’t a fan of bleachers. I have a lot of trouble with back pain so a folding chair is a must for me. I always bring our Kijaro folding chairs wherever we go. If there isn’t room for a folding chair, I always make sure to have my padded bleacher seat with armrests. It is absolutely wonderful! Miscellaneous Essentials. There’s lots of little essentials I never leave home without including sunscreen, bug spray, wet wipes, tissues and an umbrella. I have used so much bug spray this past season. It’s like my son is a magnet to bug bites! Once you’ve gone to a few games during the season you’ll find out there’s other items you should always have with you. I always jot down a note in my phone if I realize I’ve forgotten something or I need to add to my must haves. Oh, and last but not least… don’t forget the sport supplies! These are my must have for my sports mom survival kit. I’d love to hear what you all pack. What’s your favorite sports mom essentials? Comment below and share with us!